Recognize the qualities of good ideas and implement them. Ideas are a dime a dozen, but the people who know when to use them are priceless. Recognizing great ideas and putting them into action is a skill you can develop. But you must be able to identify when good ideas are actually bad. I know what some of you are thinking. How can a good idea be bad? Take a step back and just bear with me for a moment here. Again and again, I see people let great ideas slip by because one element or factor makes it ineffective. Once you can identify the factors that could spoil a good idea, you’ll be able to figure out if your good idea is actually a bad one. With 2018 coming to a close, people all over the world will enter 2019 with new ideas. Shockingly, just 8 percent of people achieve their resolutions. Why is this the case? Well, these seemingly good ideas are, in fact, bad. In this guide, I’ll explain different scenarios of how good ideas can end up being the exact opposite, and how to test your ideas to make sure they’re good ones. This will help you at you at work, at home, and in your personal life as you enter the new year. Is the Idea Personal and Specific? Our society thrives on the exchange of information and ideas. There are dozens of small and large decisions we make every day based on the ideas of other people. But just because an idea is good for someone else, doesn’t mean it’s good for you. In business, ideas can be shared and improved upon. As long as you’re not violating any copyrights, patents, or intellectual property, you can take an existing idea and make it better. Self-improvement, however, requires a more personal touch. It’s not in your best interest to set goals that mimic the goals of other people when you have no skin in their game. These sound like great ideas, right? So you decide that you’re going to do the same thing. But you’re making a big mistake. Because as far as you know, this is just some kind of plan your friend pulled out of thin air. How do you know it’s going to work for you? How do you know it’s going to work for them? It probably isn’t going to work. Their goals are not specific enough. With no specific goals, how will you be able to tell if you are making any progress? You could drive by the gym every day, but that won’t do you any good. You could cut down from four to two fast-food cheeseburgers a day, but you probably won’t see any results. How often are you going to meditate, and for what purpose? What kind of benefit are you seeking from the meditation, and how will you know when you’ve achieved it? It’s one thing to save, but it’s another to keep it. Where are you putting the money? What’s your plan? Your friend’s resolutions are not specific enough to be successful. And if you adopt these, they will never mean much to you because you didn’t think of them yourself. You have to set your own goals and develop a game plan that suits your mentality, accompanied by a schedule that allows you to achieve the goals. If you don’t take these personalizing steps, your chances of success greatly decrease. The point is that you shouldn’t always follow what other people say and do. If you aren’t one already, this may be why you aren’t a leader yet. Think for yourself. Act for yourself and your own purposes. Resolutions are personal, and specific goals help you accomplish them. Take time to figure out what’s important to you, what you want to accomplish, and what you need to spend more time on—then develop specific goals to achieve these things. 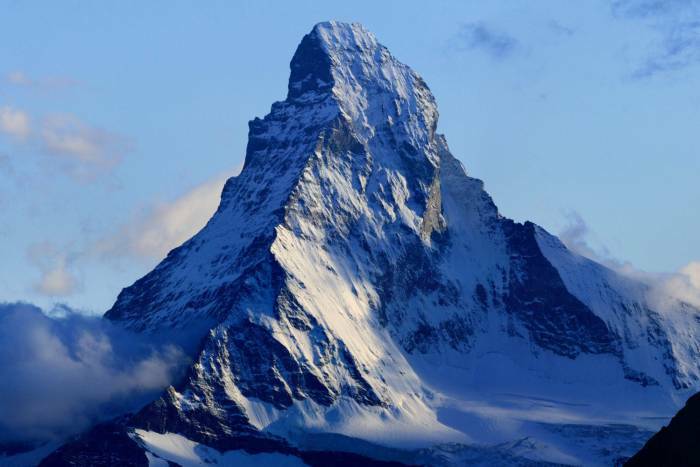 Contrary to the popular song lyrics, not every mountain is meant to be climbed. You’re not going to go scuba diving in the arctic circle. You’re not going to try to pet a wild lion in the jungle. You’re not going to challenge a motorcycle to a footrace. Some ideas sound great, but they are just not realistic or within your means to achieve. OK—so those examples may seem obvious. Let’s talk about some actual ideas you might have that are unrealistic. As New Year’s resolutions, 45 percent of people want to lose weight or get in shape. This is a good idea, but only if you set realistic goals. Don’t expect to lose 10 pounds in your first week of eating right and exercising. Trying to reach a good goal too fast and too soon can set you up for failure—or worse, disaster. If you are the type of person that likes to hyper-focus on goals to get them done, maybe that’s something you should try to do—it depends on your personality. You might like to aim for a target, attack it, and get it done. But a lot of people would view that as traumatic. So they might aim for something like losing one pound per week until they reach their desired weight. For them, an idea like this might seem more attainable and might increase the odds of accomplishing what they set out to do. Sometimes the situation calls for the shooting for the stars and hoping that you land on the moon. However, successful people know how to determine if their ideas are realistic. To do that, you need to do your homework—figuring out the approach that fits your style of thinking and way of life. What is realistic for one person may be unrealistic for another. Ideas sound great, in theory, but when you take the time to do some research, you’ll discover early on that not all ideas can be successful. This is a common problem that I see when people have an idea to start their own business. They jump in head first without taking steps to validate their idea. 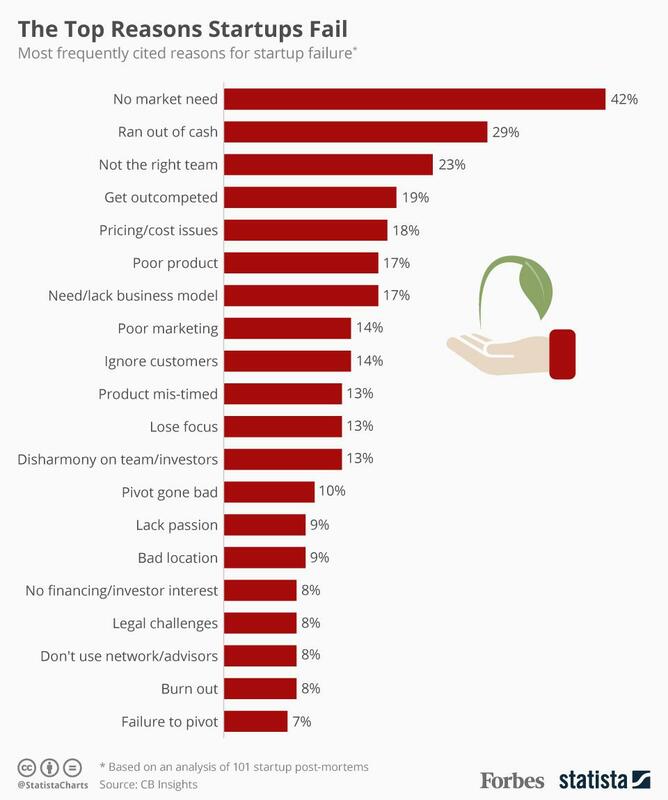 Just look at the top reasons why startups fail. As you can see from this graph, the number one reason why new businesses fail is because there is no market for the idea—in other words, no one else is interested. They may be in a very small niche market that just doesn’t have much potential, or they could have chosen a market that is dying and shrinking. A successful business can’t just be a vanity project. First and foremost, it has to serve a greater need. These entrepreneurs started a company without doing their research first. This is an expensive mistake that you can avoid with diligence. Not every idea that pops into your head is destined to make a million dollars. You’ve got to dig deeper to make sure that it’s viable before you start investing time and money. Timing is everything. I learned a long time ago that an idea that is right for the time is a powerful force. I meet so many people that have great ideas at the wrong time. Let’s continue with the New Year’s resolution analogy here. When people tell me their resolutions, I usually have the same reaction . . . Why wait? 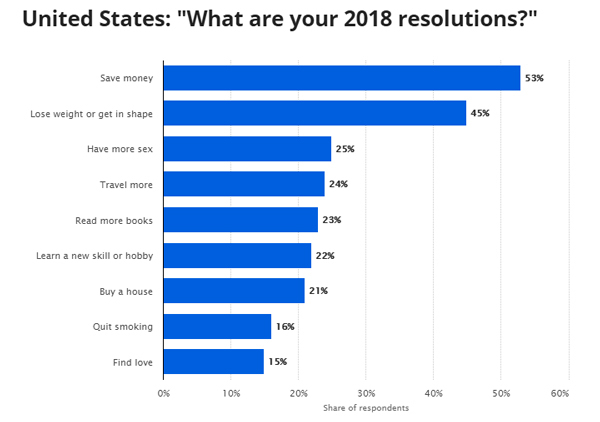 Here’s a look at the most common New Year’s resolutions from 2018. There is nothing wrong with these ideas. But again, why wait? People tell me in August that they are going to start saving more money next year. Why not start saving money right away? Saving money is not a bad idea, but if there are no barriers—aside from your mindset or spending habits—why not start right away? Putting off something so important is misguided. Establish good habits now—not tomorrow, not next week, not next year. Learn the habits of highly confident people, and mimic their actions. Once you have established good habits, then you can determine whether now is the right time to start achieving your goals. Do you want to travel more? Do you want to buy a house? Those ideas sound great. But if the timing isn’t right, they are bad ideas. Take into consideration the legitimate reasons you have to put off a goal. What if your travel plans conflict with important events that will accelerate your professional career? What if you can’t afford a house right now? Those are both bad ideas. That’s why 80 percent of resolutions fail before February. The first of January isn’t some magical day where the timing is perfect for you and everyone else to have a great idea—it’s just another day. You have things to do and limited time to get them done. Ideas are only relevant if the timing is right. How many times have you thought of the perfect thing to say . . . two days after the conversation? If your idea is too late, then the opportunity for it to work has already passed. For example, let’s say you think of a way to revolutionize the taxicab industry with an on-demand ridesharing app where drivers can use their own cars. Great idea. But this already exists. Maybe you work in product development at your job. Your team is already months into manufacturing a new product, but you just came up with an idea for an even better product. It might be too late. The business already invested in the product that’s in development. So this new idea is bad because the timing isn’t right. Waiting until the new year is too late for you to start improving yourself. If you haven’t determined a legitimate reason to wait on your goals, then don’t. Don’t put things off if you can do them today—act now, or it could be too late. Do you want to start eating healthy? Do you want to lose weight? Do you want to work out more? Do you want to quit a bad habit? These are all good ideas if you start taking steps in that direction right now. Bad ideas don’t fit the situation or circumstances. If you recall from what we saw earlier, the most popular New Year’s resolution of 2018 was saving money. This must always be a good idea, right? For those of you who already have a substantial amount of money in your savings accounts, you’d be better off investing as opposed to saving. On the flip side, if you have lots of debt, you would be much better off paying those outstanding balances instead of saving money. It’s like a car. The outside may look clean, polished, waxed, and shiny. But that doesn’t mean that the car is ready to be raced. If the engine has problems, brakes need to be replaced, and filters need to be changed, then it’s a bad idea to race that car. Generating and then executing good ideas is like a game—you can win. To win a football game, you need to know the right situation for certain plays. You can’t always go for it on 4th down. Sometimes you need to punt. If it’s 4th down with 1 yard to go with the game on the line and a minute left on the clock, you need to be aggressive. However, this would be a bad idea at the beginning of the game when the situation doesn’t call for that type of play. Learn to accurately read the situation, and you will be able to implement your ideas in the places and times they are needed most. The wise man realizes that he has limitations. You don’t have unlimited resources or unlimited time. The dangerous thing about ideas is that, on a surface level, they almost always sound great. But when it comes time to make them happen, you need to make sure that you have the necessary resources for the idea to come to fruition. People often say that would be a great idea for an app, or you should make an app for that. Mobile devices are everywhere, and mobile app usage is definitely on the rise. So it seems reasonable to turn ideas into an app. But with that said, it’s still a bad idea if you don’t have the resources to make this happen. Do you know how to code? Do you have design experience? Have you ever developed an app before? If you don’t have these skills, do you have the monetary resources to pay for skilled labor? If you don’t have the resources, don’t be discouraged. Just because you don’t have the resources immediately, it doesn’t mean you can’t work towards possessing them in the future. When you have the right resources, you can develop a good idea into a great one. And most importantly, you can execute it. Is Your Idea Written Down? An idea is just a thought until you write it down. Once you put those ideas on paper, they become goals. What’s the first thing winners do? Write things down. Writing things down increases the chances of making them happen. After you’ve tested the idea for soundness, writing it down is a tangible, intentional effort toward achieving it. Once written down, the idea is no longer free to escape from your mind. This holds true in your personal life as well as in business. In fact, companies that have a business plan have a higher chance of securing funding and growing than businesses without one. Write down your goals. Write down your New Year’s resolutions. Break them down into smaller, more manageable goals. Look at them daily. Check them off when you achieve them. Suddenly, your good ideas are well on their way to becoming realities. Have You Set a Deadline? You have to at least set a deadline for reaching your first milestone. Remember that deadlines can always be adjusted, but until you set one, you have no mental framework for establishing how much effort per day, week, and month you need to make so you can reach your goal. Setting a deadline is like turning on the switch, like cranking the engine. It sends the signal that it’s time to go and make this thing happen. So you’ve tested your idea. It’s personal, specific, realistic, the timing is right, you’ve done your research, and you’ve written it down. What’s still stopping you? I meet so many people that have great ideas but don’t pursue them because they are afraid of failing. You need to have grit to be successful—it’s a character trait that’s much more important than IQ, and it helps you overcome the fear of failure. You need to be willing to go after your ideas and take risks if you want to win. Don’t let a good idea go to waste. Let’s say you make a resolution for the upcoming year, and it doesn’t happen—so what? Take stock and reevaluate that goal based on the other criteria in this article. Then make a new one. Yes, you want your ideas and resolutions to be realistic and attainable, but you need to accept the fact that failure is an opportunity to grow. Step up to the plate and be willing to strike out if that’s what it takes to win. Will Your Resolutions Pass the Test? People come up with ideas every day—some are good, some are great, and some could definitely use some improvement. But there are times when good ideas can be bad. As you enter the new year and come up with resolutions to improve your life, test your ideas to see whether they are good or bad. Good ideas are realistic and unique. They are meaningful to you personally and have specific goals associated with them. For good ideas to flourish, timing is of the essence. The resources and circumstances need to be right as well. Conduct the proper research to make sure your idea is actually attainable. Write down your ideas to increase the chances of making them happen. If you’re afraid of failure, buckle down and don’t let it stop you. Every failure, when you learn from it, brings you closer to success. As you generate new ideas, continue to put them through this test. If you follow the tips that I’ve outlined in this guide, you’ll put yourself on the path to winning. What ideas have you come up with for the new year? Share your thoughts with me in the comments section. Happy New Year!